St. Benedict founded twelve communities for monks about 40 miles east of Rome, before moving to Monte Cassino, in the mountains of southern Italy. Benedicts main achievement is his “Rule”, containing precepts for his monks. The unique spirit of balance, moderation, and reasonableness influences it, and this persuaded most religious communities founded throughout Middle Ages, to adopt it. As a result, the Rule of St. Benedict became one of the most influential religious rules in western Christendom. For this reason, Benedict is often called the “founder” of western Christian Monasticism. 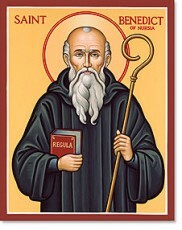 St. Benedict is the brother of Scholastica, and is considered patron of many things. He was born in Nursia, Italy and educated in Rome. He was repelled by the vices of the city and around 500, fled to Enfide – thirty miles away. He decided to live the life of a hermit and lived in a cave for three years. Despite Benedict’s desire for solitude, his holiness became known and he was asked to be the Abbot by a community of monks at Vicovaro. He accepted, but when the monks resisted his strict rule and tried to poison him, he returned to Subiaco, and became a center of spirituality and learning. He eventually moved back to Monte Cassino, and destroyed a temple to Apollo on its crest, and brought the people of the neighboring area back to Christianity. In 530 he bagan to build the monastery that was to be the birthplace of western monasticism. Soon, disciples again flocked to him as his reputation for holiness, wisdom, and miracles spread far and wide. It wasn’t long, and he organized his monks into a single monastic community and wrote his official Rule, prescribing common sense, a life of moderate asceticism, prayer, study, work, and community under one superior. It stressed obedience, stability, zeal, and had the Divine Office as the center of monastic life. While ruling his monks, most of whom – including Benedict, were not ordained, he counseled rulers and Popes, and ministered to the poor and destitute. He died at Monte Cassino on March 21st, 547 and was named patron protector of Europe by Pope Paul VI in 1964. The Church celebrates his feast day on July 11th. The St. Benedict medal is very popular among Christians to this day, and are hung above doors and windows, for protection against evil. It is believed that evil cannot enter your house if you protect every opening with a St. Benedict medal and Crucifix. The medal has an image of St. Benedict, holding the Holy Rule in his left hand, and a cross in his right. There is a raven on one side of him, with a cup on the other side. Around the medal’s outer margin are the words “Eius in obitu nostro praesentia muniamur” (“May we, at our death, be fortified by His presence”). The other side of the medal has a cross with the initials CSSML on the vertical bar which signify “Crux Sacra Sit Mihi Lux” (“May the Holy Cross be my light”) and on the horizontal bar are the initials NDSMD which stand for “Non Draco Sit Mihi Dux” (“Let not the dragon be my overlord”). The initials CSPB stand for “Crux Sancti Patris Benedicti” (“The Cross of the Holy Father Benedict”) and are located on the interior angles of the cross. Either the inscription “PAX” (Peace) or the Christogram “HIS” may be found at the top of the cross in most cases. Around the medal’s margin on this side are the initials VRSNSMV which stand for “Vade Retro Satana, Nonquam Suade Mihi Vana” (”Begone Satan, do not suggest to me thy vanities”) then a space followed by the initials SMQLIVB which signify “Sunt Mala Quae Libas, Ipse Venena Bibas” (“Evil are the things thou profferest, drink thou thy own poison”). St. Benedict was inspired by God to found the Monastic life that is known to the Western world to this day. Many orders of St. Benedict are alive and well today. He was drawn to be a hermit, and focus solely on God, but spent his life serving others by founding monastic life. He knew that he must not follow what “he” wanted to do with his life, but rather follow God – and do what He was asking of him. He had a gift from God to share, and he realized that. Because of St. Benedict saying yes to God, we have been blessed with many wonderful Religious, who followed his Rule, and said yes to God.